Bellaire TX is known as the “City of Homes,” since this Houston suburb is known for its beautiful developments. Bellaire is just a hop, skip, and a jump from everything Houston has to offer. But this family oriented city boasts lovely, quiet, tree-lined streets and tranquil parks. The residents of Bellaire love to decorate their homes and make them as stunning as they could be. Each homeowner has his or her own style. Which is why we custom design and hand craft each stained glass window or door we build, to that client’s tastes, style, and specifications. 1. Collaborating with one of our designers to find the perfect style and design. 2. Ability to have stained glass done in any size or shape, from permanent installations to movable hanging panels and more. 3. Choosing from a huge array of patterns or creating their own. 5. Commissioning stained glass in the style of their favorite designer, for instance, Frank Lloyd Wright or Charles Rennie Mackintosh. 6. Choosing the types and colors of the glass. Bright and vivid? Subtle and earthy? Colorless, clear, frosted, or textured? 1. Adding privacy. For privacy issues, Bellaire homeowners usually prefer our leaded and beveled stained glass designs, for maximum privacy plus maximum light. This type of stained glass is perfect in Bellaire’s entryways, and will also take them from generic to unique. 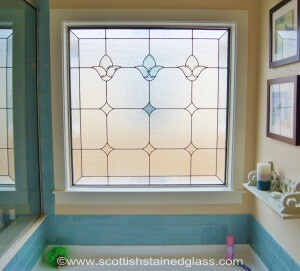 The same style of stained glass is also perfect for more privacy in any hallway, bedroom, or bathroom windows. 3. Blocking an undesirable view and replacing it with something much more enticing and appealing to look at. If one of your windows opens onto a view of your neighbor’s garage or home siding, an old shed, or perhaps even the street, you might want to replace that view with some custom crafted stained glass art that you will not tire of enjoying. 4. Last but not least, did you know that the installation of our custom stained glass windows or doors adds value to your home? And if you decide to ever sell it, that same stained glass just might be the one feature that prospective buyers flip over. 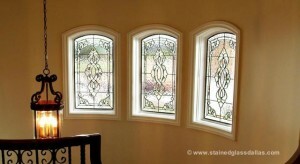 Every stained glass panel we build is customized to our client’s tastes and specifications. Every stained glass panel we build is hand crafted by one of our talented local artisans.